During 2017, after several years of discussions at the political and engineering levels, the Russian government finally took the first steps toward lining up long-term funding for the super-heavy rocket, which, if ever built, could support human exploration of the Moon and, possibly, even an expedition to Mars. 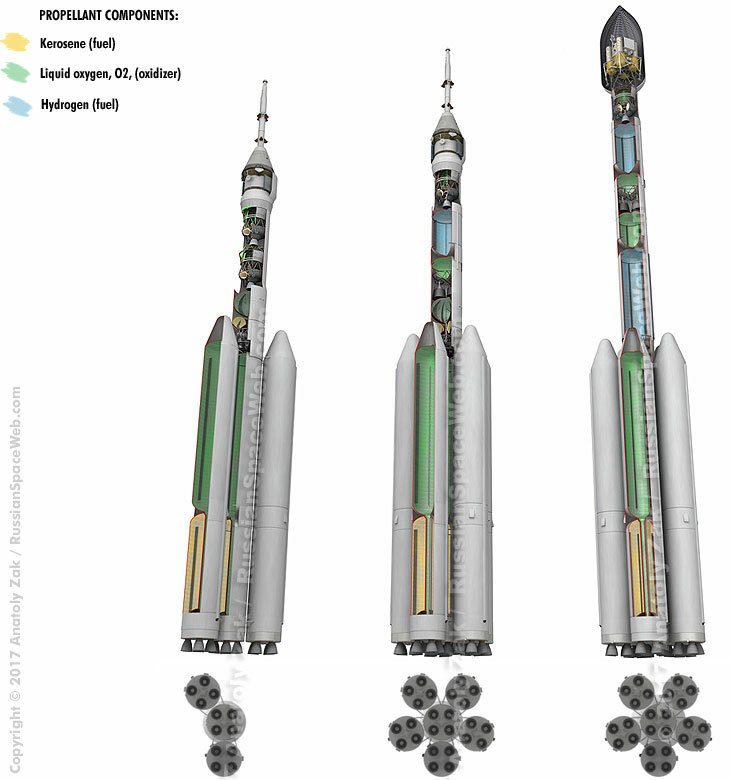 The super-heavy rocket family as envisioned by Roskosmos in the second half of 2017. At the beginning of the year, Roskosmos was predicting the first launch of the super-heavy rocket around 2035. Such a remote date was likely based on the funding levels originally allocated to the Research and Development Project, OKR, called Elements of the Super-Heavy Class, or shortly in Russian Elementy STK, which would lay the technical foundation for a big rocket. However, the program appeared to be receiving new political impetus in the following few months. Roskosmos gave the go ahead to the Elementy STK program on March 30, 2017, with official decision KI-153-r. The initial phase of the program would finance the development of a medium-class launcher as a stepping stone to the super-heavy rocket. On June 3, the collegium of the Military Industrial Commission, VPK, and Roskosmos reviewed priorities for the development of the super booster and, apparently, accelerated the plan, promising the first launch of the giant rocket in 2028 from Vostochny Cosmodrome. Soon thereafter, the Russian president Vladimir Putin also endorsed the project during a meeting in the Kremlin with the head of Roskosmos Igor Komarov. Komarov confirmed a plan for the first launch of the super-heavy rocket in 2028, which was timed to allow the first manned lunar landing in 2030. As of July 2017, the work on the preliminary design of the rocket was expected to last between 1.5 and 2 years, according to TASS. With the political approval and initial funding at hand, Russian engineers took another look at possible technical strategies to build a super-heavy booster. Although a multitude of architectures had already been considered in previous years, yet another notional path to the super-heavy rocket emerged around the summer of 2017. 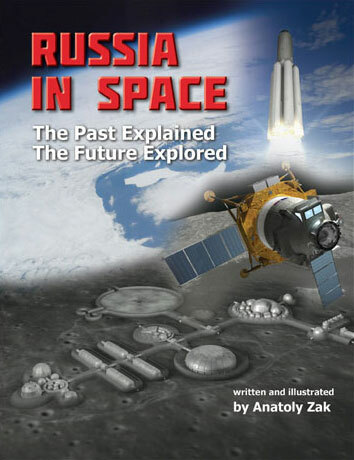 Like the preceding concept, the latest architecture relied on boosters previously developed for the newly approved Soyuz-5 medium-class rocket, sometimes referred to as "Russian Zenit," because it was intended to replace the Ukrainian-built vehicle. However, in its latest incarnation, the super-heavy rocket would be comprised of six rather than five modular boosters lifting the vehicle off the ground. Five boosters of the first stage would be strapped around a single "core" booster of the second stage and both stages would ignite their RD-171-derived engines at liftoff. Depending on the type of upper stages used in a particular configuration, the super-rocket could deliver either 88 or 108 tons to the low Earth orbit. The lighter of the two vehicles would use one upper stage burning cryogenic hydrogen fuel and two other stages burning kerosene. In the meantime, the larger rocket would use two hydrogen-powered upper stages and one kerosene-burning stage. 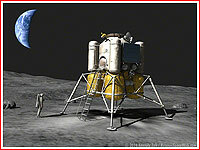 Under the proposed strategy, both variants of the vehicle would be needed for the lunar exploration program, because the smaller booster would deliver the 20-ton PTK Federatsiya crew vehicle to the lunar orbit, while the bigger rocket would carry a heavier lunar lander or the components of the lunar base. As an intermediate step between the super-heavy rocket and the medium-class Soyuz-5, a three-booster heavy rocket could be built for the delivery up to 50 tons of payload to the low Earth orbit. However, in order to use a common launch infrastructure with the super-rocket, the intermediate vehicle would have to use non-symmetrical attachment of strap-on boosters. 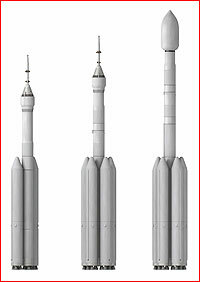 All three proposed variants would use common booster stages developed within the Soyuz-5 program, as well as an upper stage derived from the Block-DM space tug. However, two new types of hydrogen space tugs would have to be built as well, including one derived from the proposed KVTK upper stage and one much larger and entirely new design. These hydrogen stages, along with the yet-to-be-built infrastructure at Russia's new launch site in Vostochny, will likely be the most challenging and costliest aspects of the proposed plan. If the Soyuz-5 rocket reaches its launch pad in Baikonur as planned in 2022, its three-booster follow-on vehicle could begin flying from Vostochny in 2027, according to the proposed plan. The first six-booster configuration was optimistically predicted to appear just a year later, apparently to match the political goal of delivering Russian cosmonauts into lunar orbit in 2028. However, even that very preliminary plan did not anticipate the availability of the super-rocket capable of launching the lunar lander and its crew to the surface of the Moon before 2033.